On July 17, 1996, at 2031 EDT, a Boeing 747-131, N93119, crashed into the Atlantic Ocean about eight miles south of East Moriches, New York after taking off from John F. Kennedy International Airport (JFK). 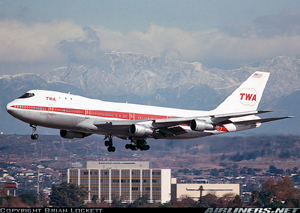 The airplane was being operated on a regularly scheduled flight to Charles De Gaulle International Airport (CDG), Paris, France, as Trans World Airlines (TWA) Flight 800. Witnesses saw an explosion and then debris descending to the ocean. The flight crew did not report a problem to air traffic control. The airplane was manufactured in November 1971, and had accumulated about 93,303 flight hours and 16,869 cycles. On board the airplane were 212 passengers and 18 crewmembers. The airplane was destroyed by explosion, fire, and impact forces with the ocean. All 230 people aboard were killed. The National Transportation Safety Board (NTSB) determined the cause of the accident was an explosion of the center wing fuel tank, resulting from ignition of the flammable fuel/air vapors in the tank. The source of ignition energy could not be determined with certainty. Of the ignition sources evaluated by the investigation, the most likely scenario was a combination of a latent fault of an electronic fuel quantity indicating system component within the fuel tank, combined with a short circuit or other fault outside of the tank. This scenario would result in a high-energy electrical arc within the fuel tank that could ignite the flammable vapors.